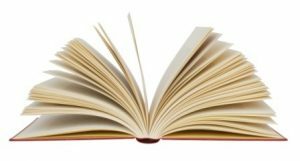 Who was Hagar in the Book of Genesis? Hagar was an Egyptian slave girl in the tribe of Abraham. She belonged to Sarah, the top woman. It was Sarah’s task to produce a son and heir, but when she could not, she gave Hagar to her husband as a surrogate. Hagar became pregnant, and God promised that her child would be the ancestor of a great nation. She bore a son, Ishmael. See Genesis 16:1-16. But she was never fully accepted into the tribe, and in the end she was rejected, and expelled into the desert. God stepped in. He protected her twice from Sarah’s hatred by sending an angel. So Hagar escaped, and lived as a free woman. See Genesis 21:1-21). Hagar — victim? or upwardly mobile? 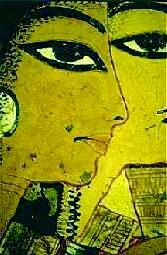 Hagar was an Egyptian girl who was a slave in the household of Sarah, a Hebrew princess. Sarah may have acquired Hagar as part of the generous bride-price paid to her husband Abraham by Pharaoh in Egypt (this story is in Genesis 12:10-20). A human being as a wedding gift? It seems strange to us. But it was an accepted practice at the time to give servants and slaves as part of the dowry of a wealthy young woman. If Hagar was a gift from Pharaoh, she was probably an accomplished servant with valuable skills. Becoming the servant of a nomadic tribeswoman may have been a step down socially for her. 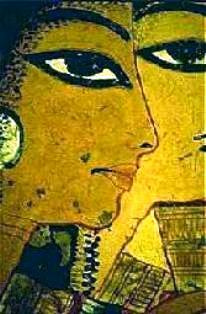 You might take a look at Egyptian love poems in Women in the Bible: the story of Potiphar’s Wife: it will give you some idea of the comparative sophistication of the Egyptians. Hagar was always disadvantaged among the Hebrew women because she was a foreigner and a slave. This was ironic, since she came from a land that was socially and politically advanced and possessed cities, temples and elaborate burial sites. Hagar must have found the living conditions of the Hebrews quite primitive by comparison. It seems that Hagar’s new owner Sarah could not conceive a child, which was after all the primary function of a tribal leader’s wife. In her own eyes and in the estimation of the tribe she was a failure, and her barren state was a constant torment. She decided to offer her slave Hagar to Abraham as a surrogate. Hagar would bear the child and look after it, but it would belong to Sarah and be accepted as the child of Sarah and Abraham. 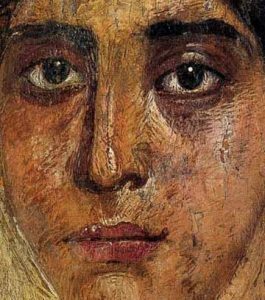 To modern people, the idea of giving another woman to your husband to bear a child seems strange and brutal, but in ancient Near Eastern family law the practice was common and acceptable. What did Hagar think of this? Was Hagar consulted in the matter? We don’t know. People at the time assumed she would leap at the opportunity. Eventually, she might be the mother of the tribe’s leader, which would make her Queen Bee of the tribe. Something went wrong between Hagar and Sarah after Hagar became pregnant. Sarah was daily confronted by the other woman’s success at conceiving a child, and believed that Hagar no longer gave her the deference she deserved. For her part, Hagar may have enjoyed being treated with respect for the first time in her life, and did not bother to hide her pleasure. The women fell out, and Sarah berated Abraham for what had happened. It was all his fault, she said. Abraham pointed out, quite rightly, that it was not in his power to do anything, since Sarah was still in charge of the women of the tribe, and Hagar was under her jurisdiction, not his. This gives us some inkling of the property rights and social power of the woman who led the tribe. She, not her husband, ruled the other tribal women and was responsible for them. In response to Abraham’s words, Sarah ‘humbled’ Hagar – the narrator ironically uses the same word that described the treatment of Hebrew slaves in Egypt at the time of Moses. 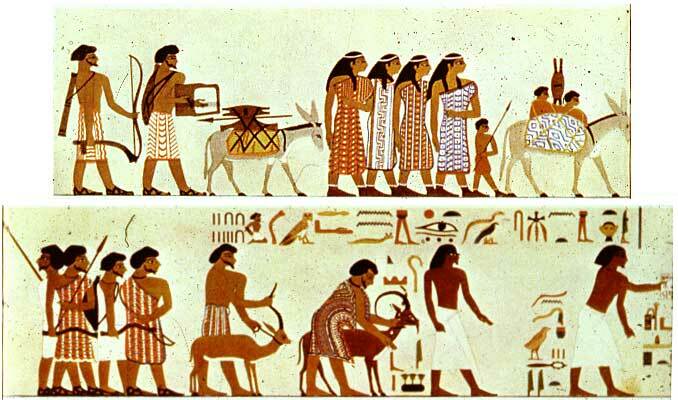 Sarah humbled an Egyptian, as the Egyptians would one day humble Sarah’s descendants. What this ‘humbling’ entailed we do not know, but it was severe enough to drive Hagar away, fleeing from the relative safety of the tribe out into the bleak landscape. Pregnant, she headed south in a desperate attempt to get back to her lost home and family in Egypt. She followed the road to Shur, which was one of the trade routes passing through the Sinai peninsula. Alone and unaided, it was a heroic effort and a tribute to her tenacity that she got as far as she did. The country is fearsome: eroded hills like bare bones in the arid landscape, the earth tormented by constant wind. Despite this, Hagar very nearly made it to Egypt. But eventually, exhausted, she stopped at a spring of water in the wilderness of Shur. At this moment, an ‘angel’ spoke to her, telling her to return to Sarah and have her baby among the Hebrews. It would be a special child, a child with a great future. So she retraced her steps and returned to the tribe, and to Sarah. ‘The angel of the Lord’ was a device used by the biblical writers to show that a human being had received a message from God. What the word ‘angel’ meant exactly is an open question. In modern terms we would probably say that a deep conviction of purpose settled on the person involved, guiding them towards a particular course of action. genderless (they are spirits without bodies). to rear that child who would have descendants without number. Sarah’s son Isaac would be born some fourteen years later. But until then, Hagar’s son Ishmael was Abraham’s son and heir, and Hagar’s status in the clan or group was solidly established. Despite Hagar’s return, the rivalry between the two women was unresolved. It got worse. The birth of Sarah’s son Isaac (Genesis 21:1-7) upset the balance of power, and the problem resurfaced. This situation was not uncommon in societies that practised polygamy. The Old Testament recognized the positions of ‘loved wife’ and ‘disliked wife’, and there were specific laws about the inheritance due to the children of both (Deuteronomy 21:15-17). You might read 1 Samuel 1:1-7 for the story of the relationship between Hannah, the beloved but childless wife, and Peninnah, the less loved but fertile wife, both married to Elkanah. Their story echoed the situation that existed between Hagar and Sarah. For fourteen years Ishmael was seen as the future heir of Abraham. He and Hagar were accustomed to being treated with respect. But when Sarah had her own son, everything changed. The question was, who would be Abraham’s heir: the first-born son, or the son of the principal wife? This was a question that would surface continually to plague Israel throughout its history. Sarah had no doubt about the matter. She saw Ishmael as a threat to her son, and the old enmity between the two women reappeared – now even more savage than it had been before. 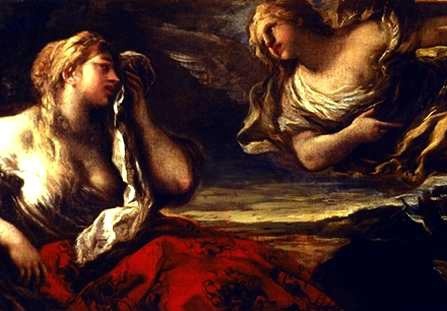 One telling detail is the way that Sarah never speaks directly to Hagar or says her name – never once in the whole story. ‘The child grew and was weaned; and Abraham made a great feast on the day that Isaac was weaned. But Sarah saw the son of Hagar the Egyptian, whom she had born to Abraham, playing with her son Isaac. So she said to Abraham ‘Cast out this slave woman with her son; for the son of this slave woman shall not inherit along with my son Isaac’. We do not know the details of the bitter power struggle between the two women, but we do know that Hagar lost. Neither of the women had ever trusted or liked each other, but now Sarah had a murderous hatred for Hagar, and actively sought her death. In a climactic scene, Sarah insisted that Hagar and Ishmael be sent away from the tribe. Abraham was uneasy about expelling Hagar and Ishmael into the heat of the open desert, since they had virtually no chance of survival. He argued against it. But Sarah’s power over him was still so strong that she could make him do it. He gave Hagar a gift of bread, the food staple, and a skin of water, a symbol of life – not so much for eating and drinking, but as a signal to the tribe that she remained under his protection, despite her expulsion from the tribe. It was a warning to Sarah’s servants that they might not kill Hagar when she was out of sight of Abraham. Alone in the desert, Hagar and Ishmael soon used up their tiny supply of water. Hagar searched desperately for more but found none, and saw her son begin to die of thirst. There was nothing she could do to save him except place him in the shade of an overhanging bush and wait. When the water in the skin was gone, she cast the child under one of the bushes. Then she went and sat a good way off for she said ‘Do not let me look on the death of the child’. In what she believed were the last moments of her life, she lifted up her voice and called to God for help. God heard her, and heard the weak voice of her dying son. Then her eyes were opened, and she saw something she had missed before: a well of fresh water. She refilled the skin that Abraham had given her with water and took it to her son, gently coaxing the water through his lips. Then she drank the water herself. She and her son continued on their journey, knowing they had only God and themselves to rely on. They spurned life in a town but lived in the wilderness of Paran instead, where the boy grew to manhood. When it came time for Ishmael to marry, Hagar took good care to find him a wife from her own people, not from the people of his father. What do the names in Hagar’s story mean? Hagar means ‘stranger’. She was from Egypt, never fully accepted into the tribe. Sarah may be a short version of Ummu-sarra, ‘the great mother is queen’. Abraham means ‘ancestor of many people’. Ishmael means ‘God hears’. Hagar was lost twice, but God heard her cry for help. Note: At the beginning of the story of Hagar, Sarah and Abraham are called Sarai and Abram; later in the story, God makes a promise to them, a covenant, and changes their names to Sarah and Abraham. To minimize confusion, ‘Sarah’ and ‘Abraham’ are used throughout. What are the main ideas in Hagar’s story? Nothing is impossible to God. God had promised Abraham he would be the father of many nations, so when Sarah became post-menopausal she looked for ways to make this happen. She did not trust in God enough to leave the matter in His hands. The foundation of the Arab nations. According to the Koran, Abraham, Hagar and Ishmael were ancestors of the Arab nations, and of the prophet Mohammed. The Koran says it was at Mecca that God saved Hagar and her son from death by thirst. Muslim ritual reflects this: every year for thirteen centuries Muslims performing the Hajj have retraced Hagar’s steps as she desperately searched for water. Hagar represents women in the Bible who are excluded or despised. This might happen because they are childless in a society that valued mothers (as Sarah was at first) or a slave in a hierarchical society (as Hagar was at first). What were families like in ancient Israel? Movies often have a journey/salvation theme, such as ‘Ice Age’: simple movies often have profound messages.